There are some houses that sell the day they hit the market and there are others that languish for months. In amongst the real estate folk it is often said that you can think of listings as being a swamp. In the first two weeks you are floating on top and easily visible but as time progresses you sink to the bottom and are forgotten. Nobody wants their house to be at the bottom. So how do you stay on top? 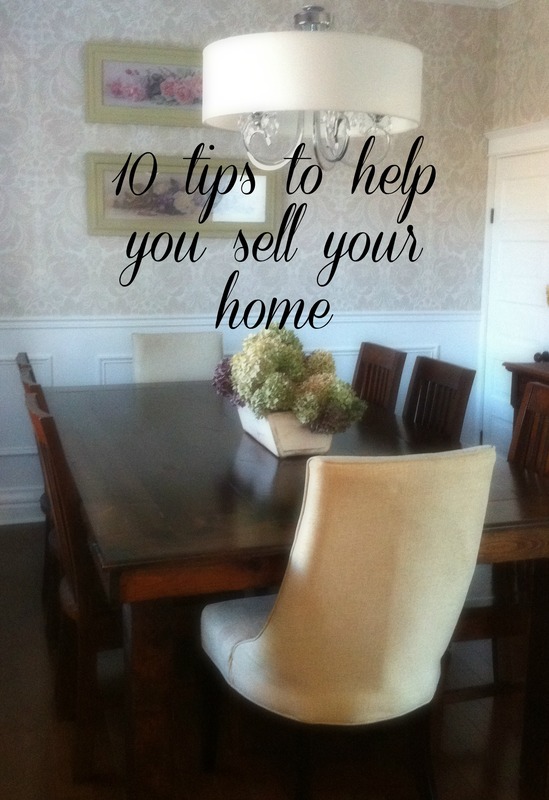 Well there are some simple tips that anyone can do to help up the resale value of your home and help it to sell quickly. Yep it’s that simple. Clean like you have never cleaned before. Buyers are superficial and judgmental and not because they are terrible people but because they are spending a ton of money and want to know that you take pride in your home and that it is well looked after. The smell of Pine Sol goes a long way. Of course you will tidy up before prospective buyers come through, but do you go the extra mile and clean around the bottom of the toilet? Make sure everything is spotless. Clean the finger prints off the oven door, mop behind the toilet, dust your baseboards and clear your fridge of art work, school notes and schedules. It’s those little details that show buyers that you care about your home. This goes hand in hand with cleaning. People want to see your home not your stuff. Put away the stack of magazines on the coffee table, remove your children’s art work from the fridge and clear the counter tops in the kitchen and bathrooms. Storage is something that buyer are always looking for. If your home seems cluttered they will assume that if there isn’t room for all your stuff there won’t be room for theirs and they will move on. A perfect example of a cluttered room is my office. Things pile up quickly and I don’t always put things away when I am done with them. A buyer needs to see how big the work space is, not how much junk the desk can hold. If your closets are barely able to close because you put all of your clutter into them it will turn a buyer off. Instead use storage bins. It keeps everything looking clean and organized and as an added bonus you will be getting a head start on packing. Fresh air and sunlight are synonymous with happiness. Showing off all the natural light your home gives your house a warm and welcoming feel. If you don’t have a lot of natural light turn on accent lighting or any decorative lights you may have. I have had experiences where I have walked into homes and been knocked over by the smell of pets or a musty basement. It is not pleasant. A simple trick is to simmer some water, cinnamon sticks, apple slices and vanilla on the stove. I use that in the winter. In the spring and summer I simmer lemon grass oil, lemon slices, vanilla and rosemary. Both smells are fantastic and cover up any odours that some people may find offensive. Try to avoid room sprays as many people are allergic or sensitive to them. I don’t mind going into a house with cats as they usually keep to themselves. I do take issue with being knocked over by an excited or protective dog. Please take your dogs with you. Most showings last 15 minutes to 1 hour so take Fido for a walk to avoid a potentially unwelcome interaction. Some quick weeding and mowing the lawn can make a huge difference in the curb appeal of your home. Clear the sidewalks and driveway of obstructions such as snow, leaves and children’s toys. Make sure that if there is any rot on your porch or pillars that it is taken care of before you list your house. 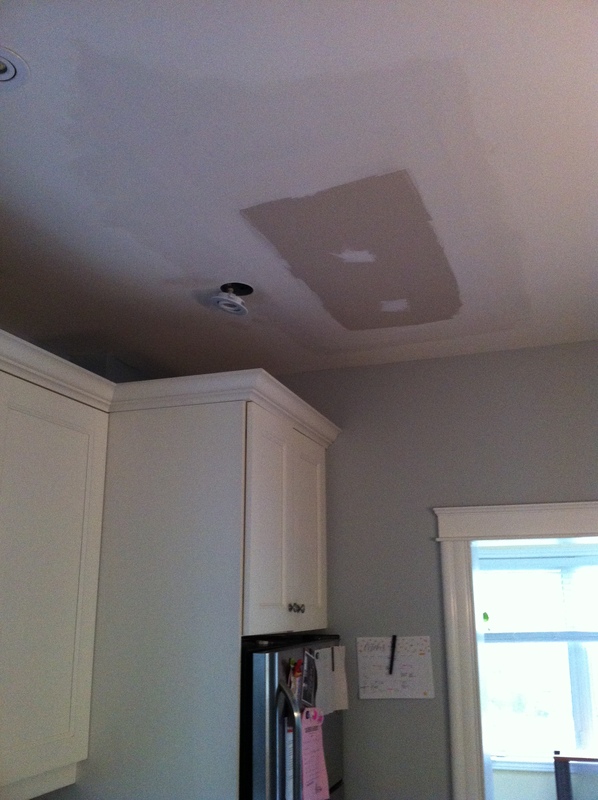 This is a picture of my kitchen ceiling. It has been like this for over a year. There was a leak but it has since been repaired and Chris hasn’t gotten around to finishing it off. If I were selling my home this would probably raise more than a few red flags for a buyer. Not only does it look awful but it makes buyers think that there are plumbing issues. Make sure your home is staged to appeal to buyers. Keep the décor neutral and make sure your whole house is organized. Place throw pillows on the couch and add a couple of blankets for a comfy look. set your home apart from other houses the buyers have looked at. Arrange the furniture so that your home has a good flow. If necessary hire a stager or rent furniture that you think will showcase your home best. This is so important. If you are lingering during a showing the buyers will not feel comfortable. If they don’t feel like they can properly inspect the home they may take a pass on your house. That being said it is your home and if you do not feel comfortable with having strangers in your home then please sit outside or in a room that the buyer isn’t in. Trying these quick and easy tips should help you sell quickly and end up with a few more dollars in your pocket.